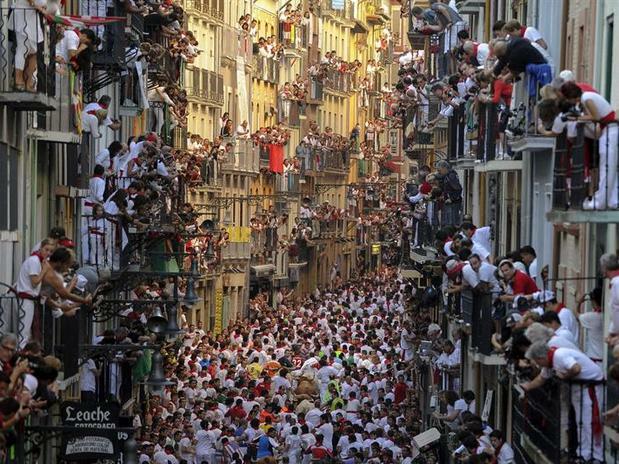 According to what we have learned from the Efe News Agency, this snapshot taken of The Pamplona Running of the Bulls by Pedro Armestre has received the International Periodismo Rey de España Award in the photography category. These awards are offered by the EFE News Agency and the Spanish International Cooperation Agency and they are sponsored by The OHL. This award means a very important international recognition as well as a cash prize of 6.000 euros and the winner also receives a sculpture made by Joaquín Vaquero Turcios. Check the original information. This same snapshot was also recently awarded a prize by Nikon (see the news item at Sanfermin.com) as the best image of the year in the press category taken by a Nikon. On that occasion there was also a cash prize of 6000 euros and the prestige of having been selected the top entry from among some 450 professional photographers who work with this brand of camera. This award also helps confirm the photographic selection of Armestre’s work made earlier by the Wall Street Journa, Yahoo or elmundo.es.